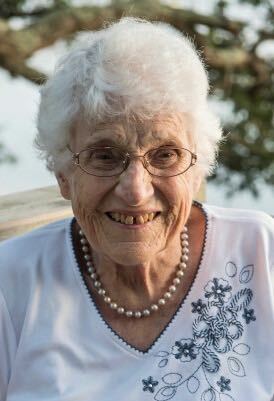 Georgie Mae Liles South passed away in Kill Devil Hills, NC at Spring Arbor of the Outer Banks on February 3, 2019. Mrs. South was born in Gates County, NC and was the daughter of the late Charles Madison Liles and Emma Lee Voight Liles. In addition to her parents, she was preceded in death by her husband, Stanley Vincent South, her five brothers and two sisters. Georgie’s survivors include her two daughters; Brenda Smith and husband David Smith of Buxton, NC, and Diane Davis of Tennessee; her three grandchildren; Ame Williams and fiancé Mark Fielding of Apex, NC, Lorie Isabell of Smithfield, TN, and Gordon Davis of Tennessee; her three great grandchildren; Laureli Hilton of Apex, NC, and Kyle Davis and Caleb Davis both of Tennessee, and also by many friends, and her Spring Arbor Family who will miss her greatly. A celebration of Georgie’s life will be held at Gallop Funeral Chapel in Nags Head, NC Saturday February 9, 2019 at 10 am. Pastor Greg Wise will officiate. In lieu of flowers, memorial contributions can be made to the Juvenile Diabetes Research Foundation (JDRF)26 Broadway New York, NY 10004.